When you design a project, it is essential that it is safe for people to use. Safety is normally covered in the research or development sections of the design process. However, you should always refer to safety when writing notes about existing products or your own ideas. Do not underestimate how important this area of design is and make sure that you often mention safety when looking at existing ideas or producing your own. Below are a number of areas that you need to consider when attempting your projects. 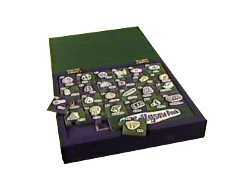 This is an example of a learning toy based on a jigsaw. 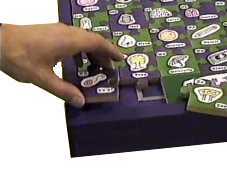 When all the pieces are placed in the correct position the electronic circuit is completed and lights flash in sequence and a tune is played by a musical circuit. The pieces are placed one by one into a frame that is part of the base. In this photograph the track for the circuit can easily be seen. An important aspect of any project, especially one for a young child, is to ensure that it is entirely safe for any child to use. 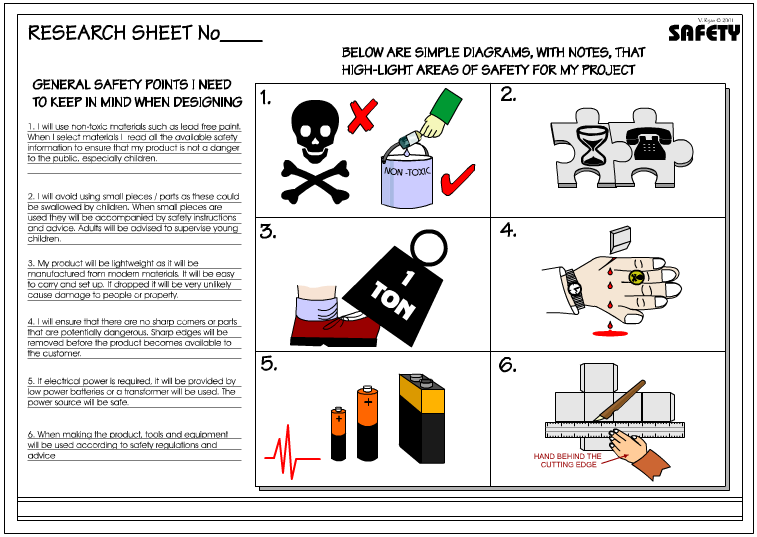 The factors listed below are some of the safety points that should be kept in mind when designing and making. If the toy has a circuit, it should be covered completely to avoid possible shocks. It should not be possible for a young child to remove a cover and have access to the power source. Small parts on the toy should be avoided as a young child could easily swallow them and choke. If there are small parts supervision is needed. A child could bite into a part. Lead is a poisonous substance, therefore, it should not be used - check paints carefully. All materials should be safe and non-toxic. All materials used should be lightweight so that a child will not be injured if he/she tries to pick it up or if it is dropped on another child. The materials must also be hardwearing. This will ensure that the device does not break easily and will last along time. You may need to consider other aspects of safety. Can you think of any that apply to your project? List them below. Safety is an essential aspect of research. The processes, equipment and materials used to make the final product must be safe for those involved in the manufacturing of the product. The final product must not put the customer in danger, in any way. Safety can only be assured if the project is planned and research carefully. Testing and evaluating prototypes and models is also important as these should raise safety issues and lead to modifications to the original design. 1. Look at existing products and identify aspects that may be a danger. Suggests solutions / improvements. 2. Draw a simple diagram to represent each safety factor. The example safety sheet seen opposite has a number of simple diagrams that are easy to understand. 3. Place detailed notes alongside each diagram. The notes should explain each safety feature/ potential danger. 4. Test existing products. For example, if you are designing a game, play a similar game and identify anything that may be a risk - even a slight risk. Take photographs of any risks and explain how you would correct each potential risk. 6. Be careful when selecting materials. Some may be potentially dangerous. For example, select lead free paints or emulsion paints as these are non-toxic. 7. Look at the law. How does the Law protect the consumer? There are several Laws aimed at protecting the consumer, what are they? 8. Look at safety information listed on the packaging of a range of products. 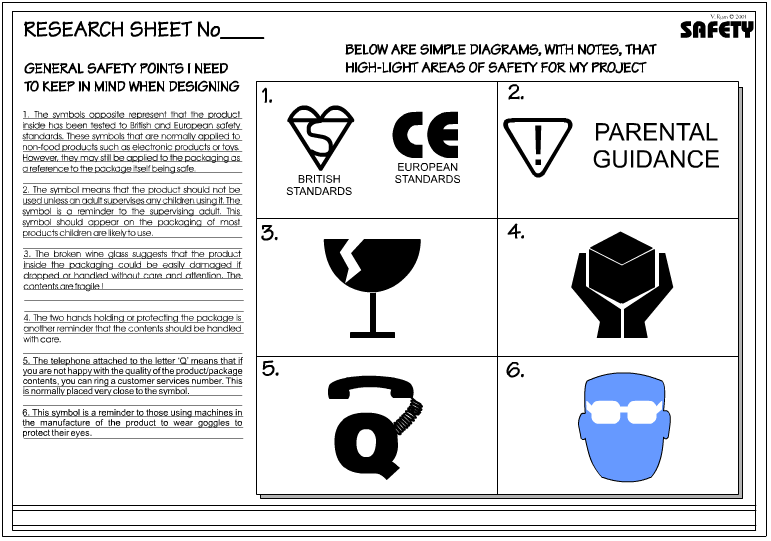 This may help you put together safety guidance for your product. 9. Investigate the safety standard symbols that are printed on products, showing that they have been officially tested and pronounced as safe for the consumer. What do each of the safety symbols represent? B. Identify faults in existing products that may lead to danger or potential risk of accidents. C. Always add detailed notes to your simple drawings /diagrams. D. Ask the views of other people. They could test / evaluate an existing product, particularly with safety in mind.